I shared this story with my family just a few hours ago and now I want to share it with all of you. The story is told in the following letter I sent at 2:30am this morning to my brother who is serving a mission in Arkansas . -Much love, the Spice Girl. The clock reads 2:21am as I am typing, but I have a story that I cannot wait to share with the world and I want you to be the first to know. October is recruiting season for corporations looking to hire college graduates for full time positions at the end of the 2015 school year. Recruiting season has been both exciting and busy for all soon-to-be graduates in the business school, especially the strategy students. Everyone here dreams of a job in investment banking or management consulting, because those positions set you up to be a business executive in the future. Consultants give expert financial and business advice to other professionals and organizations. But enough business talk, let me get to my story. Andrew had interviews in Chicago and Texas this week with two consulting firms. Prior to leaving he asked me if I would pick him up late Friday evening at 11:30pm after his flight arrived from Texas. He said the friend who he was traveling with had plans to stay in Salt Lake City (SLC) that evening and that he would rather not take the tracks home, when he could see me sooner. Of course I agreed, and at 11:00pm this evening I was on my way to the SLC International Airport. About 30 minutes into the drive I got a text from Andrew saying that his plane had landed and asking if I could meet him at the baggage claim and help with his bags. Andrew never lets me carry my own bags, let alone carry his bags. A bit confused, I arrived at the airport, parked my car, and headed into the terminal. I guess I do not remember how to navigate the SLC airport as well as I thought. I wondered through the parking garage, the car rental place, terminal 1 check-in building, and arrived at the terminal 2 baggage claim. After a quick text from Andrew I found out that he was actually at the Terminal 1 baggage claim in the next building over. As it was already after midnight, I quickly rushed over to the next building and walked in the doors. 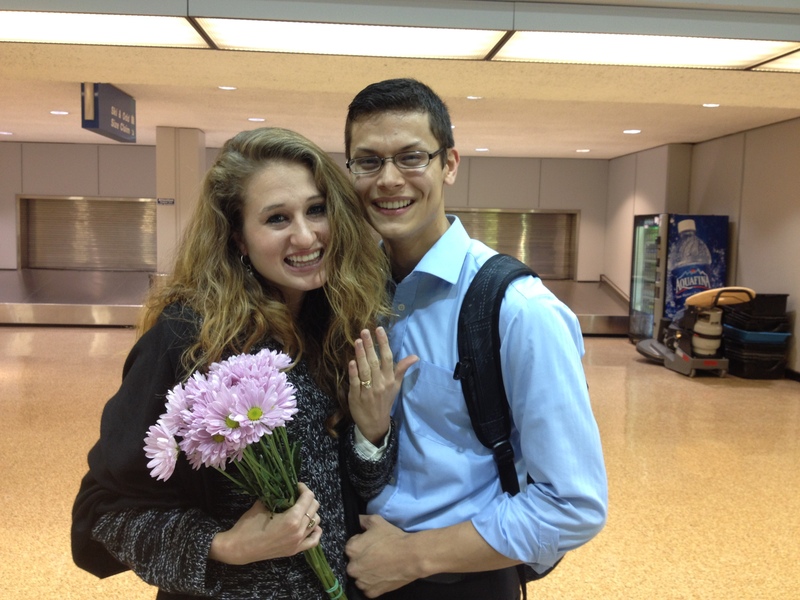 I saw Andrew waiting by the baggage carousel and began to make my way over to him. The airport was nearly empty besides a few workers, but in the distance I noticed his best friend Scott and Scott’s wife Mackenzie standing with their cameras out. Then it happened. Andrew grabbed both of my hands and told me how much he loved me. He went on to flatter me with many other compliments but my heart was racing so fast that my brain did not have enough oxygen to comprehend let alone remember what he was saying. He got down on one knee, opened up a little black box, and said, “Kylie, will you marry me?” I said yes. At least I think I did. My heart was beating so fast that I could barely hear my own thoughts. We hugged, we kissed, and we laughed. As we left the airport I noticed that all the elderly airport workers were grinning from ear to ear. Although I do remember much of what he said in those few moments prior to the big question. I do remember him saying, “Kylie, I want to travel the world with you.” A very fitting line for an airport proposal if I do say so myself. I guess he really listened to during all our conversations about my love for train stations, shipping harbors, and international airports. I applaud Andrew’s choice of location. The airport has played a major role in our relationship and will continue to do so. I still remember Andrew waiting nervously at the baggage claim after I arrived home from my 80-day journey in Asia. Little did he know that three months later he would be waiting nervously once again at that same baggage claim. The evening was more than perfect.